After a couple books us for their wedding or renewal, the very next question we get is about the reception. Where should we go? How much do they charge? Is the food good? As a mobile wedding company, you are not tied into any particular location for your wedding reception. Over the past 8 years, we have put together extensive information on the best locations. With our local expertise, we can help you find the very best location for your wedding reception so that you can continue the celebration! • A short questionnaire (and your input when we have our face-to-face meeting) that allows us to understand what type of a place for which you are looking (click here). 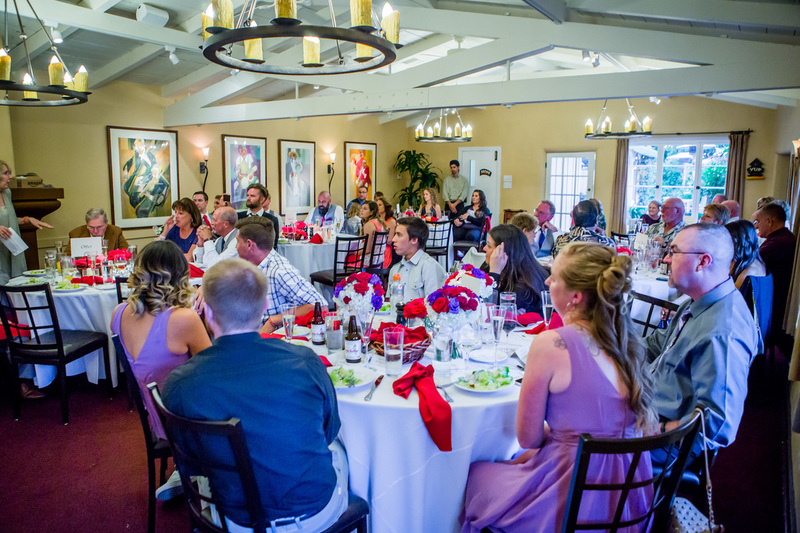 There are a lot of different types of venues from which to choose including restaurants (private and semi-private rooms), event centers, hotel banquet rooms, winery/tasting rooms, golf courses, and very unique settings. You may also decide that the best options are hiring a caterer (we work with several great ones) and having your reception outdoors on the beach or in your own vacation rental. • Based on your answers, we research and provide you with 3 terrific choices. One of our goals, of course, is to also find you a venue that is close to your ceremony site. You will receive the names and locations as well as menus, wine list, rules (e.g. corkage fees, hours), site fees (if any - most just have a food and beverage minimum) and photos. • Based on your feedback, we research your two, top choices, check availability and provide you with a cost estimate for your reception. • Based on your feedback, we provide your venue of choice with your information for their agreement directly with you and have them email the contract to you (and to us for our records). • When we ask for the contract, we do our very best to get your room booked for a couple of hours in advance of the reception so that, in a pinch, it can be used as a bad weather backup for outdoor weddings. Planning a wedding is hard work! Let us help you make this the greatest day ever!